An encounter with culture, community, and the sacred. Started in 1985 by Pope John Paul II, World Youth Day (WYD) is a celebration of youth for the worldwide Church and occurs every three years. In January 2019, the next WYD will take place in Panamá City, Panamá! Join us as we become WYD pilgrims to encounter new cultures, deepen friendships, and experience God's spirit alive in our world today! A week to encounter culture, community, and the sacred. "I am the servant of the Lord. Meet pilgrims from all over the world. Share stories, swap swag, and pray together as one universal Church. 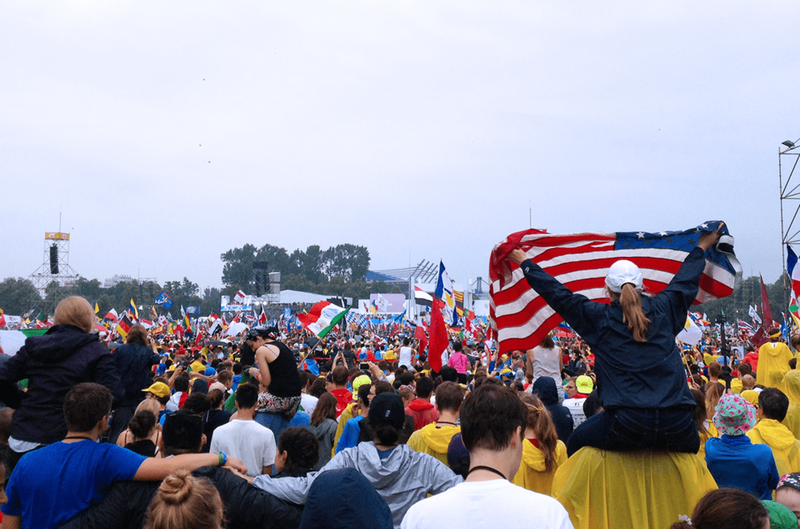 Enjoy all of the events, concerts, liturgies, and activities of World Youth Day. Highlighted by a closing all-night Vigil and morning Mass with the Holy Father. Discover the several pilgrimage sites throughout the Old City and learn about the history and vibrancy of the Church in Panamáa. Sunday, January 20 - Depart local city for overnight bus trip to Chicago O'Hare airport (pick-up location/times still TBD). Monday, January 21 - Depart Chicago O'Hare and arrive Panamá. Check into hotel and explore the city as time allows. Tuesday, January 22 - Visit to Panamá Canal in the morning. Opening Mass in the afternoon. Wednesday, January 23 - Morning catechesis and WYD events. Thursday, January 24 - Morning catechesis and Papal arrival in the afternoon. Friday, January 25 - Morning catechesis and Stations of the Cross in the early evening. Saturday, January 26 - Walk to the Vigil site and evening Vigil with the Holy Father. Sunday, January 27 - Closing Mass with the Holy Father. Farewell dinner. Monday, January 28 - Visit to the Gamboa Rainforest Resort to "pray and play" in the jungle! Tuesday, January 29 - Departure to USA. Please note: With any World Youth Day experience, dates and events are subject to change. Information about additional optional events will also be provided. The WYD Pilgrimage package includes everything needed for a successful pilgrimage! A pilgrimage asks something from the pilgrim. We're here to help guide you every step of the way - physically, mentally, and spiritually. You'll receive tips before your departure like prayer resources, a packing list, and mini e-retreats to make sure you're ready for this adventure. During the pilgrimage, you'll have a pilgrimage guide who will accompany the group and make sure that everything is operating smoothly (well, as smoothly as WYD will allow for!). Each package includes all the logistical details so you don't have to worry. You'll fly round-trip from your departure city and be transported to/from your accommodations. You'll stay in a centrally-located, 4-star hotel (seriously, only a 15-minute walk to the Cinta Costera, where many of the main events will take place). Many of the meals will also be included with WYD meal vouchers.